A machine to celebrate ecosystemical achievement. 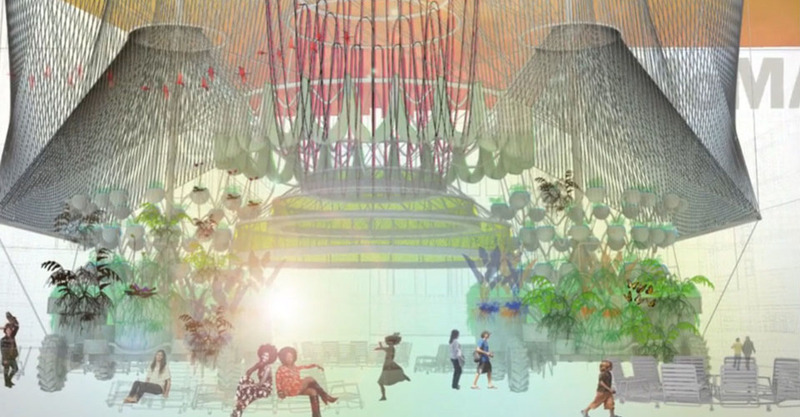 This animated video by Bolleria Industrial introduces Cosmo, the winning project for the 2015 MOMA PS1 YAP competition, designed by Andrés Jaque of Office for Political Innovation. The video begins by introducing the initial intentions of the PS1 warm up session, which opens the summer program each year. The program began in the 1990’s with a beach nicely bustling into the city where individuals and small groups could experiment with their engagement to nature, water, familiar humans, and strangers. Reinterpreted today, the architects consider water availability to be a global concern that needs to be addressed. The video presents events and studies occurring between 2000 and 2007 - indicating the urgent need to rethink how humans relate to water. This is the premise for Cosmo, a prototype machine for circulating, filtering, and purifying water. Cosmo is a complex ecosystem composed of piping, tanks, hoses, plants, and irrigation structures - which compositely create an area of climatic comfort wherever Cosmo is deployed. The installation is also connected to an app, allowing users to check on the status of water purification. The interactive nature of Cosmo will encourage users to recreate their own Cosmo, adapting the model to their needs. When the use of Cosmo is finished, it will be dismantled and all of the components will be reused and the plants will be adopted by people living in the neighborhood to enrich public space, rooftops, or other similar areas. The short film is a detailed tale introducing the aspects of the project, its connection with social issues and its aims. The imagery used in conjunction with the monologue offers visual narration of Cosmo as a system as well as to diagram its assembly and effects. The visualization reveals the project’s ability to bring water, nature, and people together.